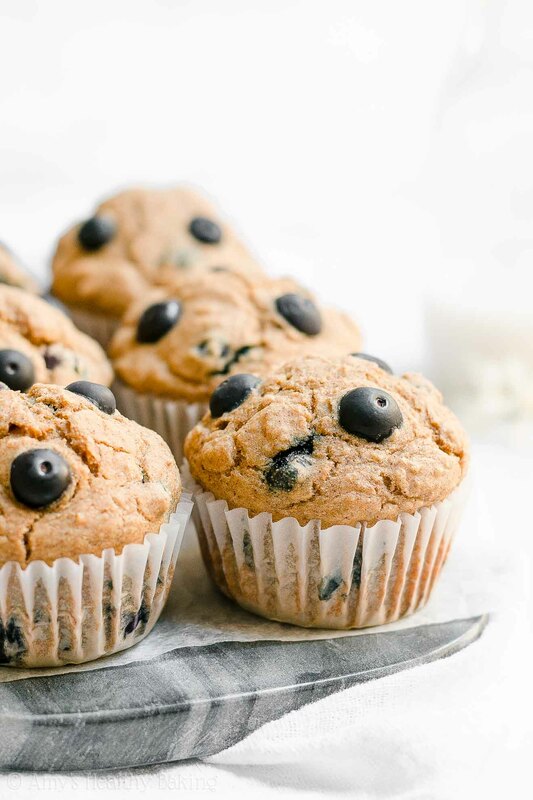 Learn how to make the BEST healthy blueberry oatmeal muffins from scratch! They’re really moist & tender, even with no refined flour or sugar! Only 118 calories! For all four years during high school, I participated in marching band. With nearly the same competition season as football, from mid to late September through Thanksgiving, we began practicing nearly two weeks before school officially started. Band camp consisted of “9 to 9’s” nearly every day. We rehearsed from 9 am to 9 pm, with two breaks from 12 to 2 pm and 4 to 6 pm. We always spent the afternoon session indoors to learn the music for our field show, and we always walked down to the football field for the evening session to go through the show’s formations. We split the morning sessions between the football field and the band room—it just depended on the outdoor temperature and whether our band director was worried about heatstroke! I basically collapsed into bed shortly after arriving home each night, completely exhausted after the full day of rehearsals, and I slept in as late as I could before heading back to campus the next day. Since each year’s show was nearly 15 minutes long, that was a lot of music and formations to learn—and my brain needed to sleep as a break, too! Before driving back to campus each morning, I usually poured myself a bowl of cereal for breakfast. Although it took very little effort to make, I couldn’t exactly eat it in the car for fear of spilling… So I knew I’d have to set my alarm a little bit earlier to have enough time to eat. But these Ultimate Healthy Blueberry Oatmeal Muffins would’ve been a much better option! They’re totally portable and perfect for quick grab-and-go breakfasts and snacks (unlike bowls of cereal! ), and they’re really moist and tender, just like true bakery muffins. Yet they contain no refined flour or sugar, and they’re just 118 calories! I definitely would’ve loved to eat one or two of these for breakfast back then… Yummy muffins + extra sleep = bliss! 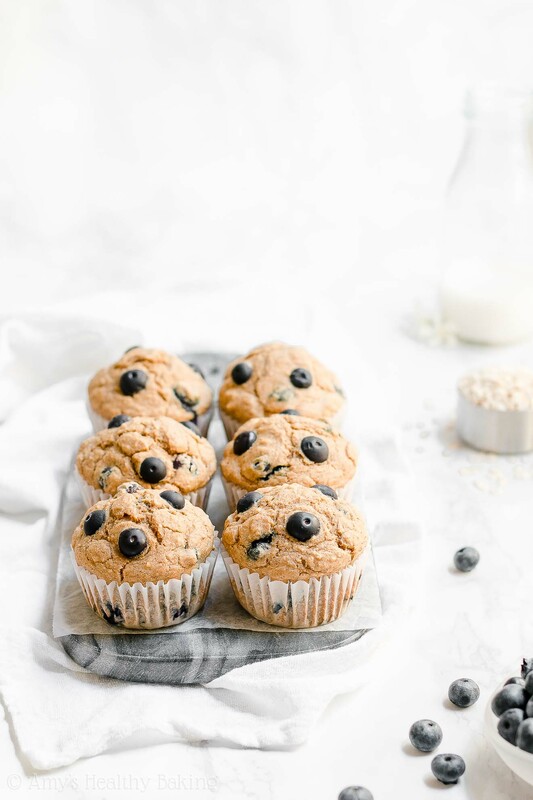 Let’s go over how to make these ultimate healthy blueberry oatmeal muffins! You’ll start with instant oats (this kind—or this for gluten-free!). Instant oats are also called “quick cooking” or “one minute” oats. They’re smaller and thinner than traditional old-fashioned rolled oats. That means they soften faster, which gives your ultimate healthy blueberry oatmeal muffins the best moist and tender texture! Hint: You can usually find instant oats in containers right next to the old-fashioned rolled oats at the grocery store! You’ll mix your instant oats with some Greek yogurt, milk, and vanilla extract next. This trick makes a huge difference in these ultimate healthy blueberry oatmeal muffins’ texture… And their appearance! Soaking the oats gives these muffins a really moist and tender texture, and it also helps them rise taller. Don’t skip this step! Just remember, it’s extremely important to measure your oats (and flour!) correctly, using this method or a kitchen scale. (← That’s the one I own and love!) 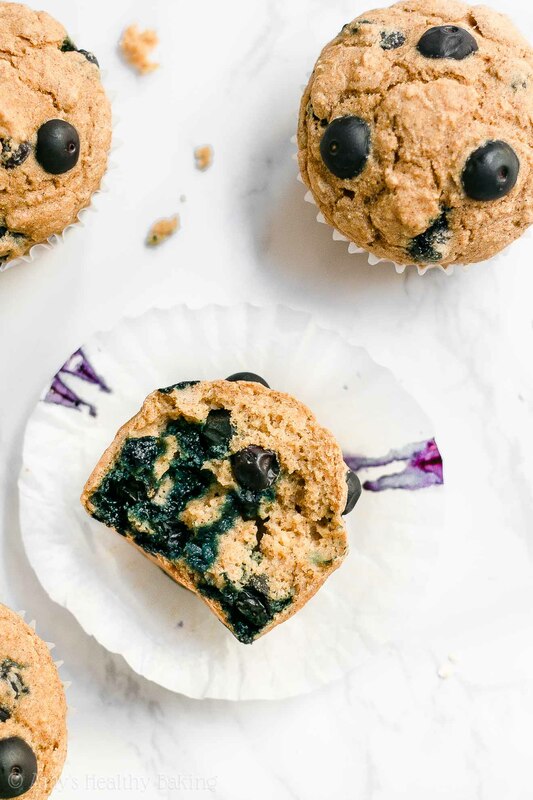 Too much of either ingredient will dry out your ultimate healthy blueberry oatmeal muffins and make them crumbly, instead of moist and tender. This is especially true of the oats because they act like little sponges and soak up as much moisture from the batter as they can! As the next step for these healthy blueberry oatmeal muffins, you’ll whisk together white whole wheat flour (like this!) with baking powder, baking soda, salt, and cinnamon (this kind is my favorite!). Although cinnamon isn’t usually an ingredient in blueberry muffins, it pairs perfectly with the oats and gives these muffins an even more irresistible flavor! As for the white whole wheat flour, such a thing actually exists… And it’s not a combination of white (aka all-purpose) flour and whole wheat flour! White whole wheat flour is made by finely grinding a special type of soft white wheat (hence the name! ), whereas regular whole wheat flour comes from a heartier type of red wheat. 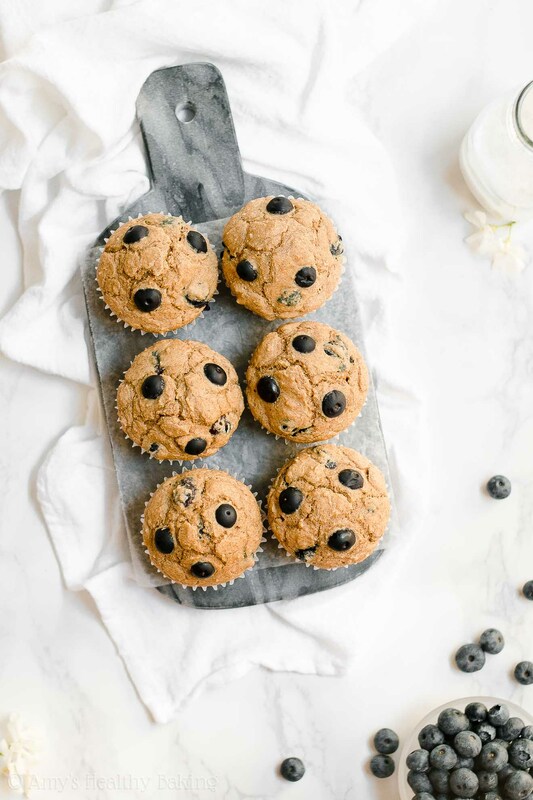 They both have the same health benefits, but white whole wheat flour has a lighter taste and texture… Which lets the moist and tender texture of your ultimate healthy blueberry oatmeal muffins truly shine! And speaking of texture… The Greek yogurt also plays a big role in that! 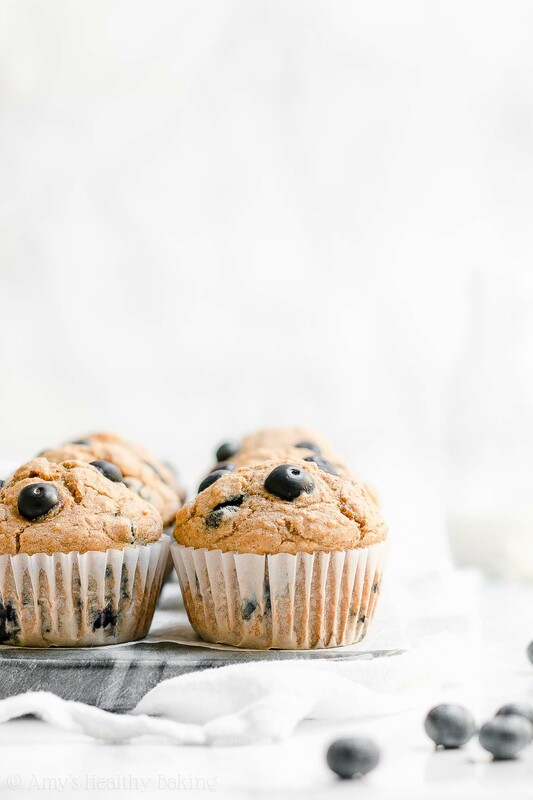 You’ll only add ½ tablespoon of butter to your ultimate healthy blueberry oatmeal muffin batter, and Greek yogurt adds the rest of that moist and tender texture—for a fraction of the calories! Plus it gives your muffins a big protein boost, too. Healthy blueberry oatmeal muffins + low calorie + moist and tender = math I love! 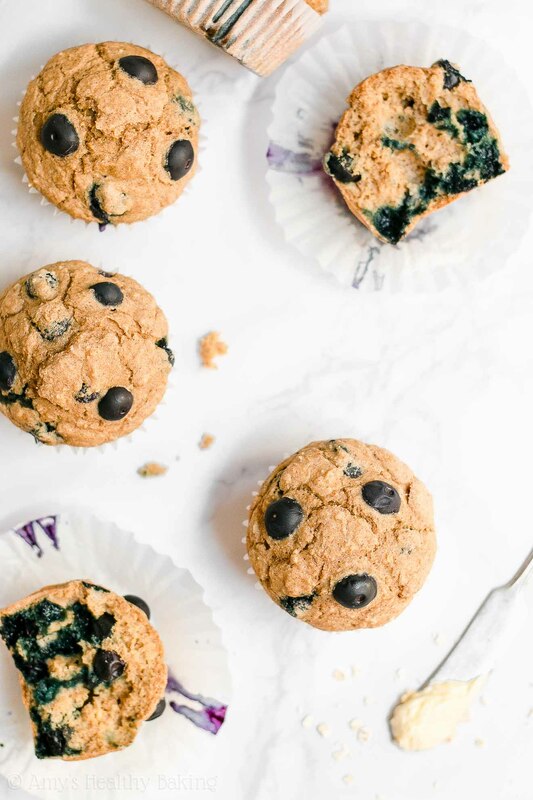 You’ll skip the refined granulated sugar and sweeten your ultimate healthy blueberry oatmeal muffins with one of my favorite ingredients: vanilla stevia. Stevia is a plant-based, no-calorie sweetener that contains nothing refined or artificial (aka it’s clean-eating friendly!). 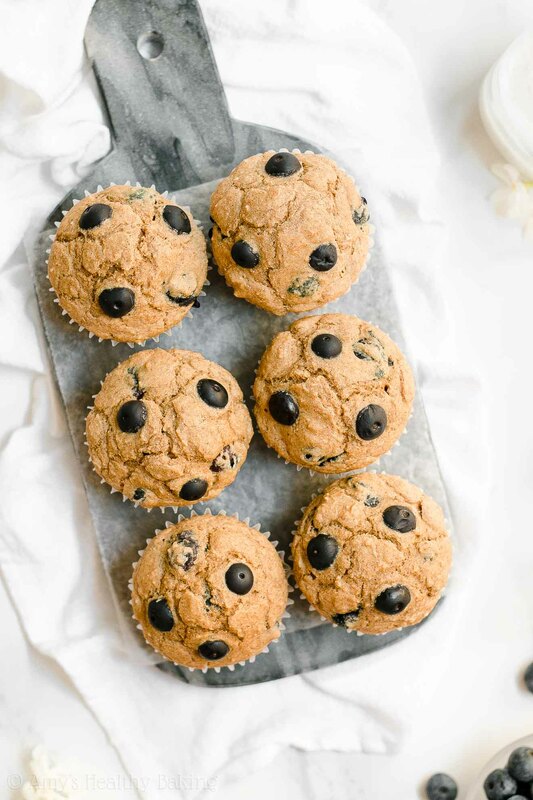 It’s also highly concentrated… You just need 1 ½ teaspoons for these healthy blueberry oatmeal muffins! Now for the star of the show… Fresh blueberries! It’s basically impossible to make the ultimate healthy blueberry oatmeal muffins without fruit, right?? 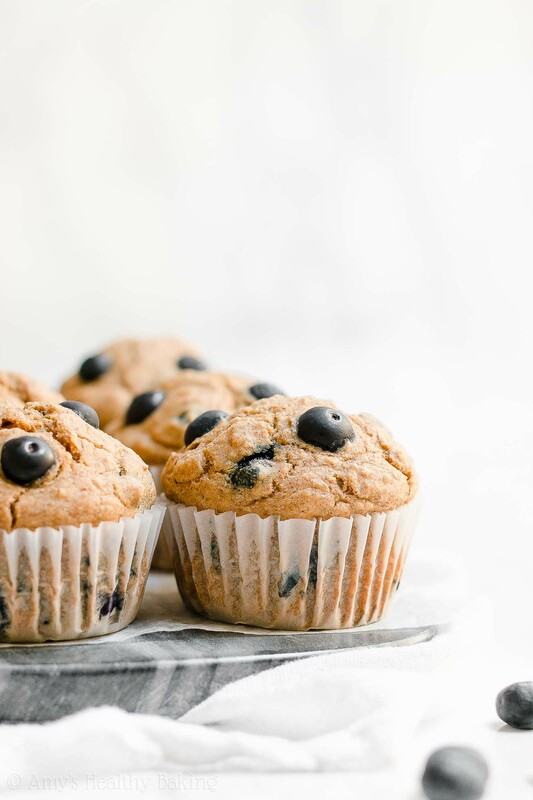 I prefer using fresh blueberries because frozen ones dye the batter a weird gray color… But both fresh and frozen will still taste the same, regardless of how your muffins look! One last thing! If you’re using muffin liners like I did in these photos, then remember to coat your muffin liners with cooking spray. This simple trick means your muffin liners will easily peel away from your muffins! Low-fat batters, like with these ultimate healthy blueberry oatmeal muffins, stick to liners like superglue… But misting your liners with cooking spray helps prevent that! 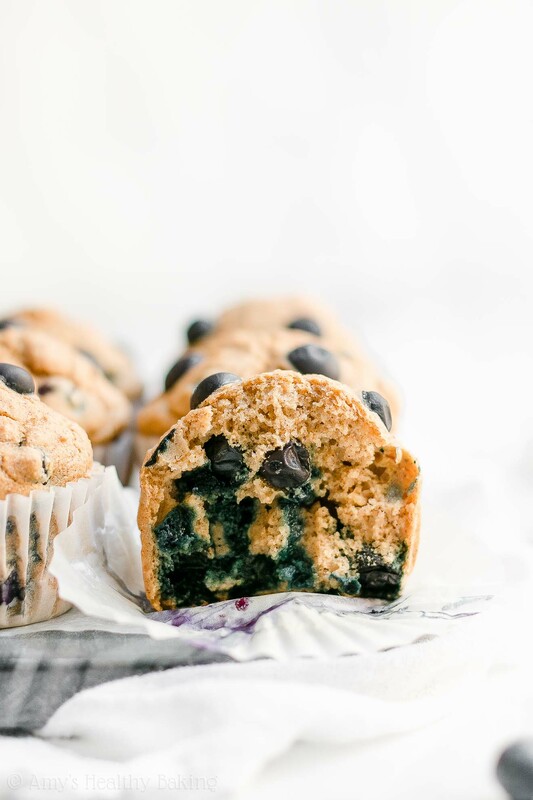 I definitely think I just found my new favorite blueberry muffins… These truly are the BEST!! ♡ And when you make your own, remember to snap a picture and share it on Instagram using #amyshealthybaking and tagging @amyshealthybaking IN the photo itself! (That guarantees I’ll see your picture! ?) 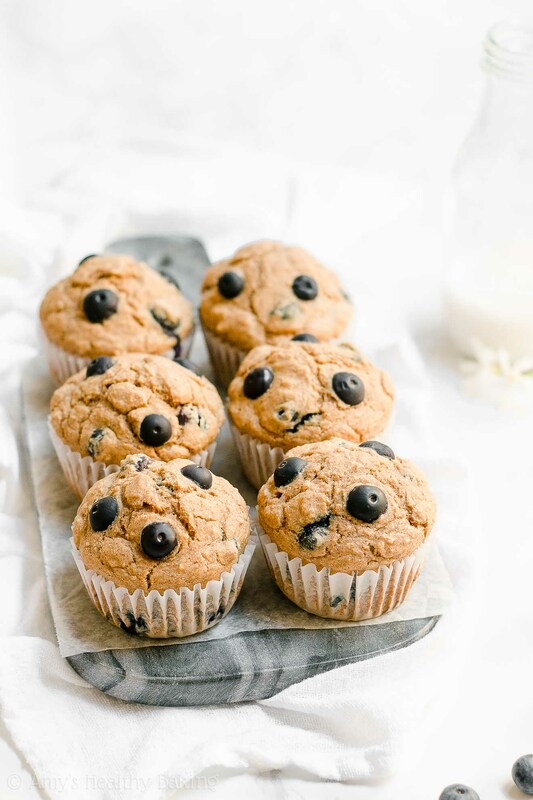 I’d love to see your ultimate healthy blueberry muffins! These muffins are supremely moist and tender, and they’re the perfect combination of hearty oats, cozy cinnamon, and sweet juicy blueberries! They’re great for quick grab-and-go breakfasts or snacks, and they freeze really well, too. Leftover muffins will keep for at least one week if stored in an airtight container in the refrigerator. In a medium bowl, stir together the oats, Greek yogurt 6 tablespoons of milk, and vanilla extract. In a separate bowl, whisk together the flour, cinnamon, baking powder, baking soda, and salt. In a third bowl, whisk together the butter, egg whites, and vanilla stevia. Stir in the oat mixture, mixing until no large lumps remain. Alternate between adding the flour mixture and remaining ¾ cup of milk, beginning and ending with the flour mixture, and stirring just until incorporated. (For best results, add the flour mixture in 4 equal parts.) Gently fold in the blueberries. Divide the batter between the prepared muffin cups. Bake at 350°F for 21-24 minutes or until the top feels firm to the touch and a toothpick inserted into the center comes out clean. Cool in the pan for 5 minutes before transferring to a wire rack to cool completely. Remember to measure your oats and flour correctly, using this method or a kitchen scale. (← That’s the one I own and love!) Too much of either will make your muffins turn out dry. This is especially true of the oats because they act like sponges and soak up lots of moisture from the batter. The muffins require 2 full egg whites. The whites contain the majority of the protein in eggs, and that protein is required to ensure the muffins maintains its shape and texture while cooling. Without both egg whites, the muffins will collapse while cooling and turn out much denser. I do not recommend substituting for the vanilla stevia, if at all possible. (It’s one of my favorite ingredients, and you’ll use it in all of these recipes of mine, too!) I buy mine online here because that's the best price I've found. However, if you really prefer to omit the vanilla stevia from the muffins, substitute ¾ cup + 2 tablespoons (120g) granulated sugar, brown sugar, or coconut sugar and reduce the milk to ¾ cup + 1 tablespoon (195mL). You may also substitute ½ cup + 2 tablespoons (150mL) pure maple syrup, honey, or agave and reduce the milk to ½ cup (120mL) instead. The baking time may vary with either of those substitutions as well. I highly recommend using fresh blueberries! In a pinch, you can substitute frozen blueberries—just remember they typically dye the batter a grayish color. The baking time may also increase when using frozen blueberries. I’m a novice when it comes to baking, so I’m pleased to have found your blog. It’s easy to follow and your recipes look very tasty ? Having recently been diagnosed with insulin-resistance (a precursor to type 2 diabetes), I’ve had to eliminate sugar from my diet and reduce carbs as much as possible. Do you know if the white whole-wheat flour you use is low-carb? And do you think almond flour would work in this recipe and those you’ve posted that are like it? Thanks! I’m hesitant to give you a blanket statement about almond flour in my recipe since it does behave differently in each type of baked good. In general, it makes baked goods that rise a lot (like muffins, quick breads, cupcakes, cakes, etc!) turn out denser. This is because gluten is what allows baked goods to maintain their shape once they’ve baked and cooled. Almond flour doesn’t contain gluten, so a 1-to-1 substitute of almond flour for wheat-based flour typically causes a denser texture. However, there is a workaround! If you use almond flour in this muffin recipe PLUS the same amount of xanthan gum that I include in my gluten-free flour blend (in the Notes section, directly underneath the Instructions! ), your muffins should turn out with a much better texture. Xanthan gum imitates gluten’s structural properties, which is why I include it in my gluten-free flour blends — it ensures your gluten-free baking turns out with basically the same texture! 🙂 Does that make sense? I’d love to hear what you think of these muffins if you decide to try them! Yes, that makes very much sense. I think that maybe I could have figured this out for myself without bothering you if I had actually read the notes. Sorry! Anyway, after I make them, I will come back and leave a quick reply to let you know how they turned out :O) Thank you! No need to apologize, Martha! I’m always happy to help! 🙂 I can’t wait to hear how your muffins turn out! Hi Amy ! I’m sorry if you have already answered this… but you so mention in the beginning that it would be beneficial to soak the oats first . Would you recommend water, milk? How much and for how long ? I apologize for the confusion Valerie! You soak the oats in yogurt, milk, and vanilla (the first sentence of Step 1). I already built the soaking step into the Instructions! 🙂 I can’t wait to hear what you think of these muffins! Just what I need to use the blueberries in my fridge! I used unsweetened almond milk and GF flour. They turned out wonderful. Love the flavor, burst from the berries and the cinnamon! Yum! Your site is among the top of all baking sites that I’ve seen. The recipe instructions are clear and informative. You seem to anticipate any questions about substituting similar ingredients and you offer flexibility that addresses real-life bakers. So thank you for that, always. I’d like to ask you about one more possible switch/substitution: I use non-fat yogurt by the quart, but for many reasons, I prefer the regular, not “Greek”. I know the main difference between them is simply that the whey is strained out to make the Greek yogurt, so I typicall strain my regular yogurt until it reaches the consistency of the Greek yogurt.. I have to guess at the amount to start with and sometimes I think I have strained it too much, but generally it’s a successful substitution. Maybe others would be interested in doing that too, so among all the other suggestions you have, perhaps you could add this one too. But, bottom line — keep sending your good stuff out. I look forward to all of it. Thank you so much for your kind words about my site and recipes, Roz! That truly means a lot to me. 🙂 Yes, you can use your regular nonfat yogurt in this recipe! I’m glad to hear that’s been working for you. I can’t wait to hear what you think of these muffins if you try them! These are super tender and just perfect in every way…except one. The are ADDICTIVE ! I ‘ll make a double batch the next time. Any substitute for vanilla stevia? Like honey ? If so, what are the measurements please? Yes! I’ve actually covered that exact question already in the Notes section of the recipe, located directly underneath the Instructions. I know it can be easy to miss! 😉 I can’t wait to hear what you think of these muffins Hesty! I’ve had a rather bad time of dealing with diabetes and high blood pressure (and recovering from a mini-stroke), and trying to find sugar-free, wheat free ANYthing turns out to be either Keto (which medically I can’t manage) or just tastes like cardboard. When I found these muffins, I was skeptical–since everything else I seem to bake comes out too dense, or with some weird flavor. Not so with these–I made a couple of changes: I used fat-free sour cream instead of yogurt (all I had in the fridge, will try the yogurt next time); almond flour instead of a gluten-free blend; and 1/4 cup Swerve confectioners sugar instead of stevia. I also followed your directions on using gluten-free flours in your Baking Basics 101…man did that THAT ever make a difference!!! I can really see where I’ve been doing this all wrong. Thank you! And thank you for the most delicious muffins. I don’t feel so “weird” when I can finally find something I can eat that isn’t so limited! WOW!! Ellyn, this is the best compliment ever — I’m so glad you enjoyed these muffins! That means the world to me!! 🙂 So happy you found the gluten-free tips useful too! A doctor had me go gluten-free for a few months a while ago, and I quickly learned a lot so my baked goods wouldn’t come out with weird textures or flavors. I’m always happy to pass along that knowledge! 😉 I hope you continue to make progress on your health and recovery journey!! Hi Amy. I tried baking these wonderful muffins today and they were absolutely delicious! I made a few alterations to the recipe. Instead of skim milk-almond and added 1/4 cup more. This is because I used a small amount (1/8 cup) of coconut flour. I used unbleached white flour for the rest. Instead of the Stevia I added 1/2 cup of the backing Truvia for sweetness. The moisture was beyond what I expected! The sweetness was almost to my liking so I will add a bit more of the Truvia next round. For toppings-shredded coconut flakes and a sprinkle of slivered almonds! Super moist and nice to look at too! Oh also used coconut oil liquid non flavored in place of butter. Thank you for an excellent recipe I plan on making over and over again. I needed a healthy version of muffins since my blood pressure is a little high. Need to cut back on sweets so this is a perfect pairing with my afternoon Dandy Blend decaf healthy coffee substitute. I’m so glad you enjoyed these muffins Jeri! That means the world to me that you’d want to bake them again in the future. That’s the best kind of compliment, so thank you! 🙂 I really appreciate you sharing your recipe modifications too — I always love hearing what tweaks work!